Horde3D • View topic - Simple program using SDL2 not rendering at all. Simple program using SDL2 not rendering at all. Post subject: Simple program using SDL2 not rendering at all. The above is compiled with: "g++ h3d.cpp -lSDL2main -lSDL2 -lHorde3D -lHorde3DUtils -lGLEW -lGL"
When I mean "not rendering", I don't mean a black screen, not even that is rendered, it's a mangled version of what was behind the window before it was made. So not even the buffer is cleared. The pipeline used is the exact same as "forward.pipeline.xml" used in the sample files. Seemingly unnecessary GL calls are being done every frame. Post subject: Re: Simple program using SDL2 not rendering at all. Hi. It seems that you are doing glewInit that binds gl functions. Horde does it itself, so it can probably overlap. Try disabling glewInit. Also, you are not drawing in a loop, maybe everything is done too fast. It will later be uploaded to develop branch. It already works, but cmakelists are not yet ready. It is just the minimum code. The actual project does draw in a loop. Removing GLEW completely did not fix the issue, unfortunately. I don't think it's my code, since it worked before I switched from my own engine to Horde3D. Though I could've somehow built it wrongly, I doubt it though. Please check whether horde is correctly initialized (add bool to h3dInit). Check the log - does it contain anything suspicious? 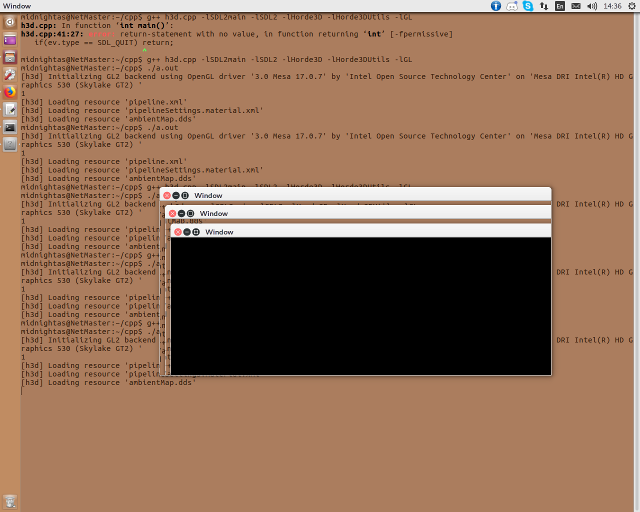 Currently the window is hidden - you can show it by adding SDL_WINDOW_OPENGL | SDL_WINDOW_SHOWN. Surface parameters are not set in your code - maybe SDL is smart enough to setup default parameters, maybe not. As for the api trace you asked - horde internally creates some default small sized textures (like 4x4) to revert to when normal textures are not available. So probably horde initializes correctly. Also, please check the resource path. As far as I remember, h3dLoadResourceFromDisk likes absolute paths. SDL_WINDOW_SHOWN is a default, so it's not necessary . Maybe you've discovered a behavior that I've seen before on development boards - that horde may not correctly draw everything on the first frame, something is not yet initialized, and everything works fine only on the second frame and further. Please try to make a loop with at least two frames. Basically, on the first frame horde always uses 320x240 framebuffer, and only on the second frame it is set to the window size. Also, you can try to draw overlays with fps, that way you'll see if everything works or not. Also, it seems rather odd that on intel hd 530 you get just gl 3.0. On the later mesa version you get opengl 4.5. Me having GL3 is probably because I have Ubuntu 16.04, although I'm not sure on that. Can you try your project or horde's samples on other machine? Do Horde's samples (that use glfw) work on your machine? It is just a guess, but try handling a resize event that SDL generates and resize the window a bit - does it change anything? Currently I don't understand what could be the cause of this behavior. I also develop Horde with Intel HD 530 and it works fine (but I work on Windows). Here's a new development: The samples work. I even ported the sampleapp class to use SDL2 (your repo kept giving me errors, sorry ), and it still kept on working. So it's apparently my code, somehow. I tried handling resize events. When it resizes, it becomes a black screen (like expected according to the pipeline). But, I'm still not sure if the issue's fixed, because if I resize it just right, similar artifacts just pop up. I'm very sorry for any time I wasted, because as always.. it's the stupidest bugs that end up consuming most of the time. Apparently, it was the pipeline that was bad. The "ClearTarget" tag had a "colorBuf" attribute, I just had to switch it to a "colBuf0" attribute. It works now. Thank you for sticking with me in my stupidest moments and being active on this forum! As for my sdl branch, it won't yet build as I had not enough time yet to make cmakelists.txt files. It was also only tested on Windows currently.